20 Books of Summer 2015! 20 Books of Summer 2016! 20 Books of Summer 2017! 20 Books of Summer 2018! Emma Kavanagh manages to write crime fiction almost in the tone of someone who has experienced the very events herself. Perhaps this isn’t so surprising given her background as she spent many years working as a police and military psychologist, training firearms officers, command staff and military personnel throughout the UK and Europe. In other words she knows how people behave in moments of peril! Once the victim has been taken to hospital of course the police have to work out who the perpetrator of such a crime is and given that the attack took place in a London park, in the morning, how could they commit such a bloody crime in broad daylight with no one spotting what was going on? So the reader has plenty to ponder and be warned although initially you may feel the pace is reasonable, it soon becomes quite fast and furious and given that the plot is complex, you need your wits about you. In other words this is a book to set aside some time to really get the best out of it. Fortunately to offset the blood and gore we have two female police officers who work well together, Polly’s somewhat less serious nature while not detracting from the crime does give the reader some smiles to lighten the load along the way. We also get to visit another location, unusual in British crime fiction which normally tends to stay fairly close to home with a big deal being made if officers cross into the next county. In this book they have to get on an airplane to carry out some of the investigating which adds a whole different feel to the storyline. The result of all this is an immensely satisfying crime fiction novel that really held my interest throughout and although I did manage to work out a tiny bit of the puzzle, the rest worked their magic and left me reeling at the outcome. This is the first in a trilogy that will feature Alice Parr a fact I was unaware of until I read the cliff hanger at the end which I have to confess isn’t my favourite way for a book to end as I suspect I will have to recap before the second book is published, but I will definitely be making sure I read a copy. 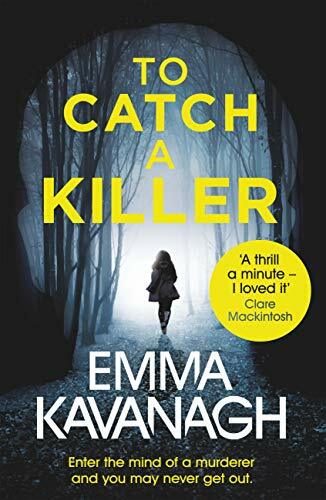 I therefore must say a huge thank you to Orion Publishing Group for allowing me to read a copy of To Catch a Killer prior to publication on 24 January 2019. This unbiased review is my thanks to them. I’m so glad I’m able to lend a helping hand! This certainly sounds like one of those deeply involving stories that doesn’t let go, Cleo. Sometimes stories really can scare the wits out of you, even though they are fiction. I think I’ll heed your warning, though, and look for this at a time when I’m ready for a book that packs this sort of punch. I’ve only read one title by this author but I quite enjoyed it. “Falling” which I read back in 2014. I’ve enjoyed them all although at a push I’d say Hidden was my favourite although it features a gunman and I usually pass on them… I think she’s a ‘clever’ writer as the story can be about one thing but she makes you think of other aspects of life at the same time. I’ve been wanting to read this author! This one sounds very good, as if it will hold me hostage throughout. I feel the same way about cliffhanger endings-I”ll read so many books in between then that I’ll definitely forget the way the last one ended-and that’s assuming the next book is only a year away! I could do with a creepy read and this sounds good! I’ve been wanting to read Emma Kavanagh for some time and I think this is the one to start with. I’ll definitely avoid eating while reading though! I’m with you – how I’m supposed to remember the cliffhanger when we get to the next book I’m not quite sure and they make me strop in the present – a classic lose lose situation in my opinion. I’ve been devouring books in this genre and this sounds like a perfect next read. Great review, Cleo! This sounds like a book I would enjoy, but I will probably skim the throat slitting description. Nice review and thanks for the warning. Brilliant review! Sounds like a read right up my alley! I had very similar reactions to yours. I didn’t guess the identity of the murderer though!